If one mirror is good, then two must be great right? Well, I'm hoping that's the case in my master bedroom. Remember this mirror my mom found for me for a few dollars? Well, she happened to find a few more for me that same day. She found this pair of mirrors for $2 each. When I saw them my first thought was to put them in our master bedroom behind the nightstands, and that's just what I did. I've been loving that look for a while and figured I'd give it a try for $4. It really opens the room up, even more so than I thought it would. Not too bad for $4. For more information on my master bedroom or the projects in it, click the picture on the sidebar. I haven't updated it with these new pictures yet, hopefully that will happen soon. the white is perfect...it lets your eye rest :) beautiful room! LOVE it!!! They fit perfectly in that space! Yay Mom! I am completely IN LOVE with your master bedroom!!!! NICE JOB! And those mirrors (all three) are gorgeous and a totally score! Frickin sweet deal!! $4 for 2? So lucky and they turned out fantastic!!! Loving your MB! This happens to be my color scheme also in bedroom! 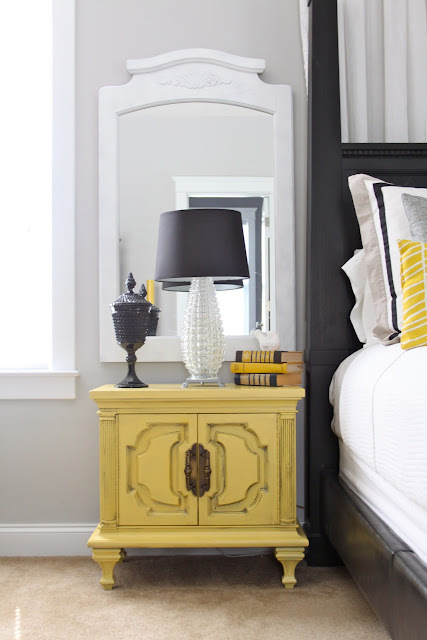 Love the gray and yellow combo. I'm your newest follower. Would love it if you could visit me sometime. Also, congrats on the baby news. 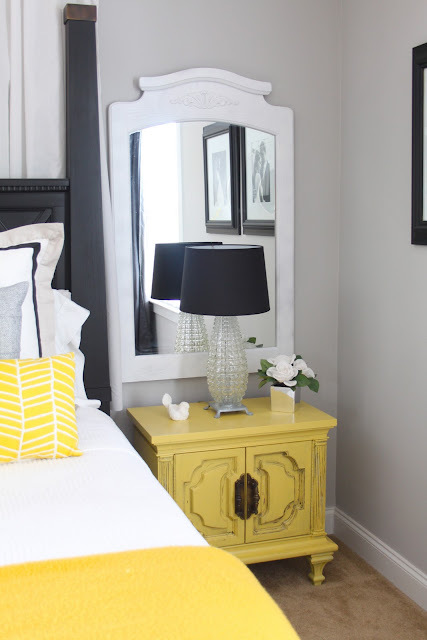 I love your bedroom>>>>I want to do something like this I've never been a fan of yellow until seeing your bedroom Wonder how a teal blue color would look in place of the yellow?